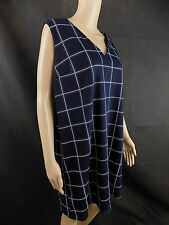 BNWT Size 16 New Look Dress. Condition is New with tags. Main colour of the dress is black with a pretty paisley pattern. Perfect on it’s own with leggings or tights. Fastened at the back with a button. Comes with a spare button. Dispatched with Royal Mail 2nd Class. Size 10 New Look Floral Dress. Condition is Used. Dispatched with Royal Mail 2nd Class. Gorgeous tiered smock dress with frilled(?) sleeves. Excellent condition. 38", WILL FIT UK 8-10, IT CAN BE WORN WITH YOUR BELT IF NEEDED. GREAT FOR OFFICE, PARTY OR GOING OUT. Peach & grey. Biba print v neck dress. Tie under the bust and elasticated waist. Chocker neck detial can be worn in a number of ways,untited,tied or in a bow etc. Machine washable. 3/4 length sleeves. 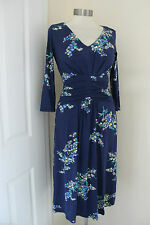 Great condition, hardly worn New Look Dress/Tunic. Odours on them. Zip fastening to the back of the neck, the zip works. Pretty Blue Vanilla dress (bought from New Look). Large. Main colours: beige, black, pink, purple, blue, green and yellow. Mever worn. Zip on the back. Ties around back. Navy blue with ditsy flowers. Babydoll smock tunic. Chiffon outer, lined. Labelled sz 12. New Look dress. Mustard & red small roses. BNWT NEWLOOK RED TUNIC DRESS. KNEE LENGTH. 3/4 LENGTH SLEEVE. A New lightweight 100% polyester smock style bohemian paisley print dress by New Look. It features a rounded neckline with gold embroidered stitching around the maroon patterned round neckline and there are bands of purple and Autumn shades of paisley printed patterns on the front and the reverse. FAB LINED BOHO MINI DRESS BY NEW LOOK IN VG CON SIZE UK 16 BUST 42"
This is such a pretty Mango dress in a size XS which i think will fit a 6/8/10 depending how loose a fit you want. The dress is 100% Polyester. Really nice lightweight fabric with an amazing black and white Paisley pattern style design all over. Lovely ladies black floral print dress with keyhole back tulip sleeves.brand new with tags .excellent condition.from clean smoke free home.no returns.please leave feedback. Pull on with pretty ties at the cuffs. This dress is cobalt blue and is a slightly silky fabric. Festival style, with fluted sleeves and embroidery detailing to the front, hem and cuffs. Fabric: 100% polyester. RRP £19.99. NEW LOOK BLACK TIER 3/4 SLEEVE TUNIC/DRESS. SIZE 10 left only. 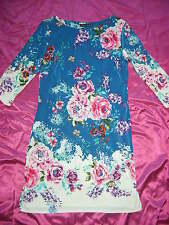 New Look floral Dress Size 8. EU 36. 3/4 sleeve. Look Again Aztec Print Suedette Tunic Dress.